The usual good wishes that my family and I offer all our countrymen and women every Christmas, are this year mixed in with the thanks we give for the solidarity and support we have received from Belizeans over the last month and a half. Ever since the nation learned of my wife's cancer affliction, people's prayers and intercession have been non-stop. This has served not just greatly to comfort us, but as a wonderful reminder of what Christmas is really about: individuals drawing closer to God and to each other in recognition of the supreme sacrifice of the Christ child, and what that has ever since meant for the ties of our common humanity. My Christmas hope, then, is for the star that lights Belize and all the world at this time, to be extra bright. May it bring good tidings and peace to everyone; but especially to those that are sick and in need. And let each of us that is able, personally reach out to the poor and the less fortunate. 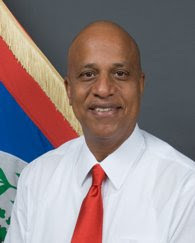 Let us, with kind words and good deeds, ensure that no Belizean is without the spirit and the good things of the season. Let us spread cheer in every corner of our beloved country. To all in this great land, then, a blessed Christmas and a prosperous 2012.